The inks for page 292, page 293, and both the pencils and inks for page 294 are up. I've gotten a few posts on the tagboard wondering about the state of FAUB, so here goes... I'm currently working on a Computer Science Masters degree at the University of Missouri (MU). Before about a year and a half ago, I was taking classes as part of a non-degree program and just being casual about it. Now that I'm in the program I've been focusing almost all of my free time on programming. In the last year, I have worked on understanding and implementing feature detection (Wikipedia) algorithms such as the Harris Corner Detector (Wikipedia) and Scale Invariant Feature Transform (SIFT) -- the SIFT++ Project and Wikipedia. I have borrowed code to perform Speeded Up Robust Features (SURF) -- the OpenSURF Project, Smallest Univalue Segment Assimilating Nucleus (SUSAN) and Features from Accelerated Segment Test (FAST). OpenSURF included a routine to match features between images. That got good results when I tried it on some comic scans but not good enough. So, I implemented SIFT and got the exact same results. Everything I've posted was stitched by hand, unfortunately. My Masters work has focused on feature tracking lately. I'm three credit hours and a thesis defense from graduating I'm have been a coding fiend. For tracking I've implemented the Hungarian Algorithm (Wikipedia) -- An awesome interactive website that shows you how the Hungarian Algorithm works. I'm currently working to implement A Non-iterative Greedy Algorithm for Multi-frame Correspondence by Khurram Shafique and Mubarak Shah. Unfortunately, I don't have much in the way of iteresting graphics to show for it. All the OpenGL code I've written isn't being used because displaying the images slows down feature detection and tracking. Now, something about FAUB. 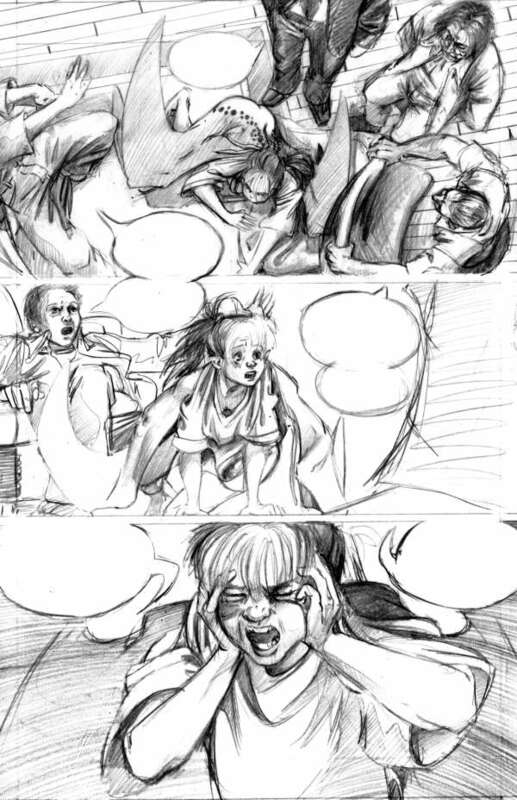 You'll notice that the pencils for pages 294 and 295 have some empty word balloons. That's because I know where the story is. I know where it's going. But I don't konw what is being said. I've not been happy with the cheesy dialog the cops have been throwing around. The whole point is to clue the readers in on what is happening in the psych ward while Sandy does her thing. I've felt that because the dialog has been so clumsy I don't want to just throw something together and have it be total crap when I know I just need to sit down and work out what's happening around Sandy and get into the heads of these people and think about what is happening to them. Instead I have a list of events. Events without emotion are not very interesting. So, three and a half pages in the last year is pretty pathetic, I'll admit. It's looking like I'll graduate in May 2010, so I can't say things will get better until then. That's just being realistic. Fallen Angels Used Books is hosted on ComicGenesis, a free webhosting and site automation service for webcomics. Fallen Angels Used Books and all characters herein are Copyright © 2003 - 2006 by John Fortman. All Rights Reserved. This means don't copy or publish this work without permission.